Pretoria, South Africa – The narrative of oppressed “white farmers” in South Africa, now being promoted by US President Trump, is a decades-old neo-Nazi and white supremacist talking point. In fact, current proponents of the South African ‘white genocide’ narrative lie at the intersection of international alt-right and white supremacist networks. Until the early 1990s, South Africa’s whites-only government used a militaristic dictatorship to enforce Apartheid, a colonial system of racial segregation with European settlers at the top. The racist, authoritarian Afrikaaner government eventually ceded power and allowed open elections after decades of resistance by black protest movements as well as an international divestment and sanctions movement. Since the end of the apartheid era, neo-Nazis and white supremacists in South Africa as well as North America have clamored about a ‘white genocide’ in South Africa in which they claimed black Africans were carrying out mass murder with the goal of exterminating white people. Recent controversy over land reform in South Africa, along with some armed robbery incidents at isolated rural farms, have been seized upon by peddlers of ‘white genocide’ as the latest proof that descendants of occupying Afrikaaner settlers should be treated as an endangered minority. Violent white supremacists often identify with long-collapsed racist governments in Africa. Dylann Roof, who killed nine people at a black South Carolina church in 2015, sported the apartheid-era flags of Rhodesia and South Africa on his Facebook photo. South African racist groups have spent the last year courting support from the North American far-right, an effort which seems to have paid off as their messaging has now spread from Fox News directly to the President of the United States. Petzer has a cozy relationship with Gavin McInnes, the founder of the Proud Boys, a far-right gang-like fight club with ties to white supremacists. In light of President Trump’s recent endorsement of South African white nationalist messaging, the relationship between Willem Petzer and Gavin McInnes provides an illuminating example of how racist, white supremacist, and even neo-nazi ideology often lies behind rhetoric that claims to present a humanitarian call to protect a besieged white minority in South Africa. Petzer has been a repeat guest on McInnes’ radio programs, and recently interviewed Gavin on his own YouTube show. In Petzer’s interview with McIness, streamed live on July 29, Petzer was given McInnes’ blessing to start his own chapter of the Proud Boys in South Africa. Petzer and McInnes discussed ‘white genocide’ conspiracy theories at length, and both stated their belief in the inherent superiority of majority-white countries. Petzer also made clear his contempt for his black African neighbors when he described to Gavin McInnes how he may gift Gavin a shirt but “It wont be in the best condition though, it will stink a bit, it will smell uh, you know, African…” He also stated his belief that “black South Africans…are far worse off… than they were under Apartheid” without citing any statistics to support this assertion. In the interview Petzer also tells McInnes that be believes that South Africa is waging “a war on whites” and that he considers black Africans to be “primitive,” uncivilized people who need to have cities built for them by white people to avoid living in “huts.” He went on repeat his own take on the ‘Empty Land Myth,‘ a disproven theory that white-settled areas of South Africa had been previously uninhabited by blacks which was invented to support European claims to occupied African lands. Petzer and McInnes also spoke favorably of Orania, a ‘whites-only’ settlement in South Africa’s Northern Cape that was founded as Apartheid collapsed. Orania, which Petzer recently visited and described as “utopian,” continues to exist today as a racially exclusive zone where “blacks are not welcome.” Town officials with ties to Apartheid regime planners have been accused of seeking to replicate pre-democratic South African society. The contents of the ‘Willem Petzer Live Chat’ Discord server, obtained by Unicorn Riot and now published in our DiscordLeaks database, show a high degree of similarity to North American alt-right chat rooms, down to the same racial slurs, 4chan lingo and Pepe and Trump memes. Mostly in English but at times chatting in Afrikaans, Petzer’s fans often used degrading, racist language to describe black people, and also expressed anti-semitism as well as hatred towards LGBTQ people. 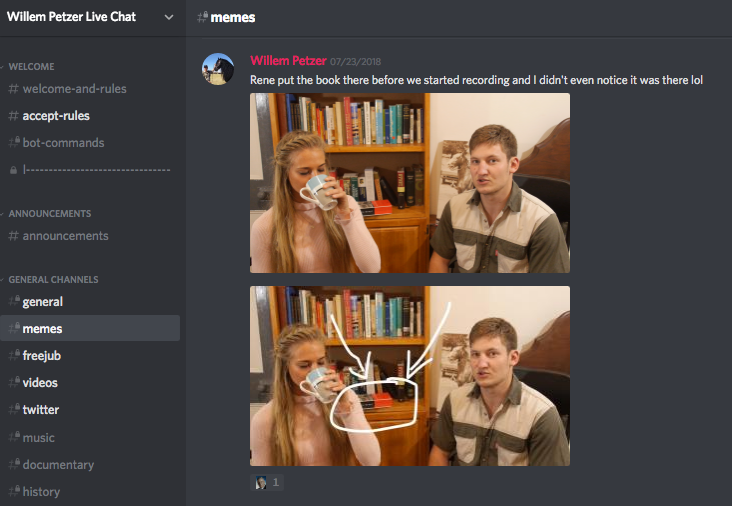 ‘Rob,’ one prolific user in Petzer’s Discord, described himself and others in the chat as “straight up nazis.” Other memes posted in Petzer’s Discord chat celebrated the Pinochet dictatorship in Chile throwing political dissidents out of helicopters. 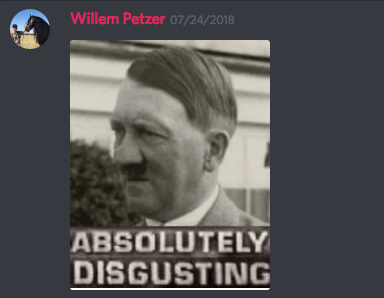 Petzer himself also shared a meme based on an image of Adolf Hitler. Petzer also talked in his Gavin McInnes interview about how he owns and has read a copy of Hitler’s memoir Mein Kampf. In one Discord post, he also joked about accidentally leaving his copy of Mein Kampf out on his shelf where it can be seen in one of his YouTube videos. The kinship between Willem Petzer and Gavin McInnes is hardly the only link between white supremacists in South Africa and North America. Simon Roche of the racist South African Suidelanders militia recently toured the United States, during which he repeatedly met with openly racist and fascist groups such as American Renaissance and the League of The South, who helped organize Unite The Right in Charlottesville. Rational Disconnect recently carried out a step-by-step debunking of a video of Simon Roche in conversation with white nationalist talking head Stefan Molyneux. A review of history and statistics shows how Roche and Molyneux, and other proponents of South African “white genocide” repeatedly misrepresent and distort facts about poverty, crime rates, land ownership, and history in South Africa to support their notions of black Africans as inferior, uncontrollably violent people who need to be civilized under white authority. The spotlight brought by President Trump’s tweets onto claims of South African ‘white genocide’ promises to add wind to the sails of the white supremacists who pushed the narrative into the public eye. However, it will also likely bring more scrutiny on the nature of the claims being made, and the motives of those making them. The international far-right’s cry for sympathy for specifically white South Africans seems to fly in the face of glaring racial inequality that persists in the post-Apartheid era. The average white income in South Africa is five times higher than the average black income. According to the Institute for Poverty, Land and Agrarian Studies at the University of Western Cape, white people own 67 percent of South African farmland despite making up only about 8 percent of the population in a 2011 census. The choice to focus on the suffering of exclusively white people in a poor, mostly black African country is less mysterious when one considers that the narrative is being pushed, at least in part, by white supremacists and neo-Nazis. 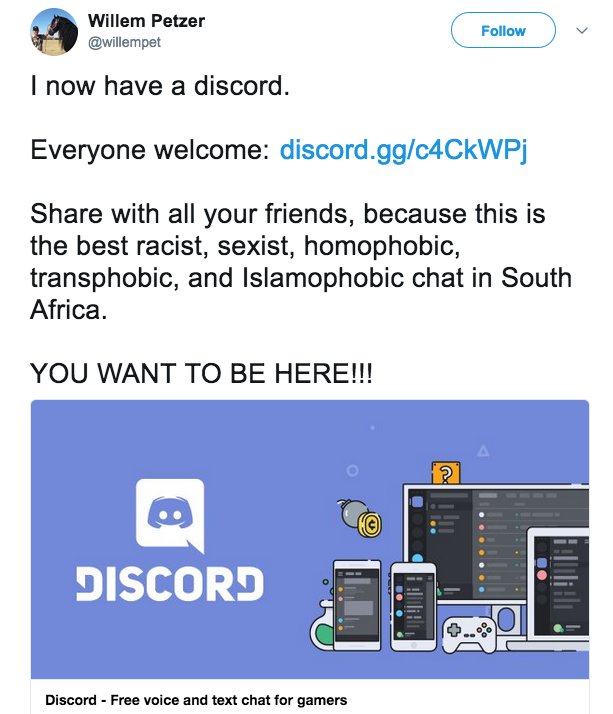 At least two participants in Willem Petzer’s Discord chat seemed to have no illusions about their intentions in throwing their weight behind pushing the story of ‘white genocide.’ “How we doing?,” asked user ‘plasma’ on Wednesday afternoon, just hours before President Trump’s tweets.